Who would have thought Nigel Havers’ agent would have published not one, but two volumes of memoirs? That’s twice as many as the actor himself. But then Michael Whitehall has found himself unexpectedly famous in his later life, thank to his son Jack dragging him into his comedy world though Backchat and now Travels With My Father. Playing up to Whitehall Sr’s curmudgeonly person, the very title Backing Into The Spotlight suggests a reluctance to be in front of the camera… even though he confesses to having had more fun on the Netflix travelogue than the irascible ultra-conservative image should allow. And early in life, he tried many careers including shelf-stacker, film critic, private tutor to the son of the first British spy imprisoned in the Soviet Union, and prep school teacher, where his stint seems to echo Decline And Fall – the Evelyn Waugh novel, recently adapted for TV with Jack in the lead role – given its collection of eccentric, unqualified teachers. But in the early days it is not Whitehall’s employment, but his home life in suburban Beckenham, that proves the most evocative. His mother Nora was the epitome of snobbish social aspiration, a real Hyacinth Bucket of a character, full of airs and graces. She wanted everything ‘a la carte’, her phrase for bourgeois niceties such as knitted dolls placed over the loo rolls, and would tell neighbours her husband was a retired naval officer, when in reality he worked in a department store. For shame! He shares how he got Haver to flirt with a potential buyer to try to shift his house, with the charmer telling the star-struck woman he was thinking of buying a place up the road; how Avengers star Patrick McNee used to send naked photos of himself... which Whitehall once managed to leave at The Garrick club by mistake; or of the time Nigel Davenport took a swing at a director in an audition. He didn’t get the role. Backing Into The Spotlight is one of those showbusiness memoirs that comes from a different era. For example, he tells of how, after he formed one of the first independent TV production companies, he managed to sell an action series on the flimsiest skeleton of idea: that the two lead characters would be called Guy, so the show could be called The Good Guys. That – in those days – was enough for a commission over a generous lunch at The Ivy, casting and a writer could be figured out later. In a surprising revelation, it appears Whitehall could have had a much earlier shot at TV fame rather than waiting for his son to become successful, since he was offered his own ITV chat show to replace Russell Harty, when he defected to the BBC in 1980. The book also takes in other parts of his life, too, flitting between stories rather than being a straightforward chronological autobiography. That includes snapshots from his family life - as well as Jack, he is also father to Molly and Barney, while his wife Hilary is a saintly yin to his grumpy yang: ultra-efficient and ultra-affable, striking up relationships with everyone she meets. A highlight is the story of Hilary trying to rescue a badly injured cat she spotted in the road – where Michael wanted to administer a fatal blow and be on his way - which plays out like an hilariously gruesome slapstick, the Tarantino version of Some Mothers Do Ave Em. There’s also a substantial tribute to another of Whitehall’s clients, Richard Griffiths, who was also Jack’s godfather. The book includes a eulogy the comedian wwrote anda letter Griffiths penned to the toddler Jack, treating him as if he was an adult. It’s rather off-topic, and does slow down the pace of Michael’s first-hand stories – but the affection in which the real Uncle Monty was held shines through. 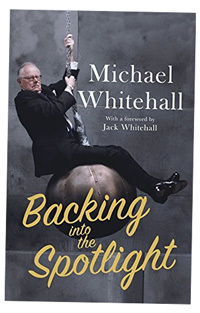 • Backing Into The Spotlight by Michael Whitehall has been published by Constable, priced £18.99. Click here to buy it for £15.99 from Amazon.